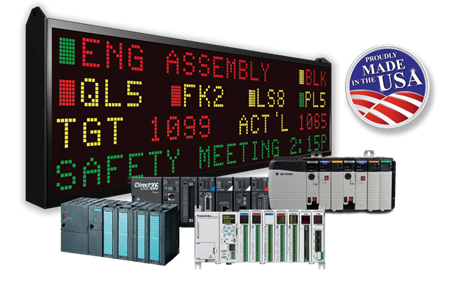 Monitors and displays plant productivity with absolutely no PLC ladder logic change. Free EZ iMarquee Programming Software. Displays Alarms as a priority message; superseding the normal messages. Supports all major PLC communication protocols. Built-in Math Logic / Scripting for advanced programming. Import tag database from PLC and add messages to be displayed on EZ iMarquee depending on event condition of a Boolean/Discrete tag or a value of an Integer tag. •	EZ iMarquee can be used for efficient plant wide communication. •	Production schedule, efficiency, goals etc. can be broadcasted plant wide. •	Bottle necks, Alarms, Machine maintenance can be effectively displayed. •	An excellent ROI for a fraction of cost.